The move is part of a series of measures included in the government’s response to the Internet Safety Strategy green paper, published today. The Government has been clear that much more needs to be done to tackle the full range of online harm. Our consultation revealed users feel powerless to address safety issues online and that technology companies operate without sufficient oversight or transparency. Six in ten people said they had witnessed inappropriate or harmful content online. The Government is already working with social media companies to protect users and while several of the tech giants have taken important and positive steps, the performance of the industry overall has been mixed. The UK Government will therefore take the lead, working collaboratively with tech companies, children’s charities and other stakeholders to develop the detail of the new legislation. "Digital technology is overwhelmingly a force for good across the world and we must always champion innovation and change for the better. At the same time I have been clear that we have to address the Wild West elements of the Internet through legislation, in a way that supports innovation. We strongly support technology companies to start up and grow, and we want to work with them to keep our citizens safe. "People increasingly live their lives through online platforms so it’s more important than ever that people are safe and parents can have confidence they can keep their children from harm. 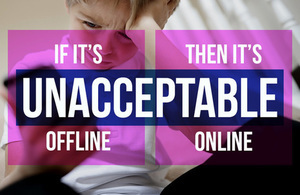 The measures we’re taking forward today will help make sure children are protected online and balance the need for safety with the great freedoms the internet brings just as we have to strike this balance offline." DCMS and Home Office will jointly work on a White Paper with other government departments, to be published later this year. This will set out legislation to be brought forward that tackles a range of both legal and illegal harms, from cyberbullying to online child sexual exploitation. The Government will continue to collaborate closely with industry on this work, to ensure it builds on progress already made. "Criminals are using the internet to further their exploitation and abuse of children, while terrorists are abusing these platforms to recruit people and incite atrocities. We need to protect our communities from these heinous crimes and vile propaganda and that is why this Government has been taking the lead on this issue. "But more needs to be done and this is why we will continue to work with the companies and the public to do everything we can to stop the misuse of these platforms. Only by working together can we defeat those who seek to do us harm." The Government will be considering where legislation will have the strongest impact, for example whether transparency or a code of practice should be underwritten by legislation, but also a range of other options to address both legal and illegal harms. We will work closely with industry to provide clarity on the roles and responsibilities of companies that operate online in the UK to keep users safe. The Government will also work with regulators, platforms and advertising companies to ensure that the principles that govern advertising in traditional media – such as preventing companies targeting unsuitable advertisements at children – also apply and are enforced online. "We welcome the Government’s commitment to making the UK the safest place to be online and the recognition of the need to bring industry, charities and the public together to tackle the risks and opportunities the online world brings. "We have long seen the harm that online can bring to children’s lives, our own child sexual abuse services saw a 38% increase last year in children referred. Online can be a force for good, but the ease of exploitation of children must be tackled. "We urge Government in the White paper to consider legislation that ends the era of technology self-regulation and puts children’s safety at the heart of the online world. Taking action now is vital to protect the next generation of children." "We’re proud to support this government’s internet safety strategy, having been part of a number of consultations seeking and representing the views of our staff, young people and schools. Here at The Diana Award we know from our powerful peer to peer education programmes the positive part that technology plays in the lives of children and young people as well as the risks it brings. "We look forward to seeing government, industry, businesses, schools and the wider children and charity sector workforce continue to work together to make the internet a safer place for all." Any changes recommended by the Law Commission’s Review of Online Offensive Communications, announced by the Prime Minister in February, will be considered as part of the legislation. This work forms part of the government’s Digital Charter, which is working to develop the norms and rules for the online world and put them into practice, helping to make the UK both the safest place to be online and the best place to start and grow a digital business.